BIBLICAL ANTHROPOLOGY: Was Constantine a Saka Ruler? Was Constantine a Saka Ruler? The ancient city of Byzantium, later renamed “Constantinople,” was built around 657 BC on the European side of the Strait of Bosporus, the only entrance to the Black Sea. It was on the highest land of the deep inlet called “The Golden Horn” at the entrance to the Bosporus. The earliest evidence of human settlement first in this area dates to about 6600 BC and lasted for 1000 years before it was inundated by the rising sea level. Archaeological discoveries include Neolithic wattle and daub buildings with simple stone footings. The ancient residents placed mussel shells below their houses to provide permeability. Other artifacts include stone grain presses, spoons, needles and axes. Graves have been discovered with fetal-position burials and typical R1b timber graves. The Neolithic discoveries were unearthed in Pendik, a section of modern Istanbul, and at Yenikapi, both on the European side of the Bosporus. 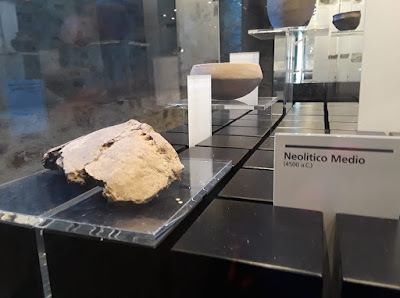 The Yenikapı excavations led to the recovery of 35 thousand artifacts covering all periods from the Neolithic Period to the time of the Ottomon Empire. Additionally, the sea filling layers between the remains of the ancient Port of Theodosius and the Neolithic layer have provided a better understanding of the changes undergone by the Sea of Marmara in the last 10 thousand years. Byzantium was a small city but it played an important role in history. The town was at the frontier between the Greek and the Persian empires, and in 478 BC the Greeks drove the Persians out of the city. The city came to play an important role in the spread of Christianity after 324 AD when Constantine the Great made it the capitol of his empire. The Beja, Kushite metal workers who inhabit the Red Sea Hills and the central desert of Egypt, are also called the Medjay. In Serbian Medja means border. Medjiana is the name of Constantine’s majestic palace outside Nis. Medijana means “on the border.” Constantine's name Medjiana for his estate signified his intention to attend to affairs of state at the border of his two realms: East and West. He often resided there and built various residences on his estate; one of them was probably built for his mother Helena. Nis was named after the Nišava River, which flows through the city and which was named Navissos by the Celtic masters of the city in the 3rd century BC. The Nišava belongs to the Black Sea basin and its catchment area is in Bulgaria and in Serbia. The Nišava was a navigable river in ancient times. The Nišava Valley is part of the natural ancient road which connected Europe and Asia: the road follows the valleys of the Morava, the Nišava and the Marica and continued to ancient Byzantium (modern Istanbul). Constantius’s two wives were Helena (the mother of Constantine) and Theodora. Theodora was the second wife and she was taken to forge a political alliance. Constantine’s two wives were Minerva and Fausta. Constantine married Fausta, his second wife, in 307, again for political reason. She was the daughter of Emperor Maximianus who insisted that Constantine marry Fausta. Unlike Helena, Fausta was not a Christian. She was reported to have been unfaithful to Constantine and falsely accused Minerva’s son Crispus of sexually molesting her. It is believed that Constantine arranged for her death in 326, shortly after he ordered the execution of his son Crispus. In the case of the first wives, there is no record of divorces, so it is possible that these rulers maintained two wives in separate households. This would be consistent with the marriage pattern of the Horite Saka rulers who settled in Southern Serbia. Constantine, the first publically Christian emperor, came to power in 312 AD, upon the death of his father. He united the empire when he defeated Licinius at the Battle of Chrysopolis in 324 AD. Following the destruction of his naval forces Licinius evacuated the garrison of Byzantium. Constantine understood the strategic importance of the city of Byzantium and established the capital of his empire there in 324 AD. The next year (325) Emperor Constantine convened the First Council of Nicaea which resolved the controversy over the nature of the Son of God and his relationship to God the Father. Because of the wicked magical enchantments so diligently practiced by the tyrant [Maxentius, who was in control of Rome], Constantine was convinced that he needed more powerful aid than his military forces could give him, so he sought the help of God. He believed arms and soldiery less important than the help of the power of the invincible and unshakeable God. So he considered which god he could rely on for protection and help. It occurred to him that, of the many emperors who had preceded him, those who had put their hope in a multitude of gods and served them with sacrifices and offerings had been deceived by flattering predictions and oracles promising prosperity and come to a bad end, without one of their gods warning them of the impending wrath of heaven. On the other hand, the one who alone had condemned their error, honoring the one Supreme God throughout his whole life [i.e. his father], had found him to be the Savior and Protector of his empire. Reflecting on this…, he decided it would be great folly to join in the idle worship of those who were no gods, and to err from the truth after such convincing evidence. For this reason he felt bound to honor his father’s God alone. Constantine’s mother was Helena. She took a deep interest in the holy places in Jerusalem and lived for a time in Palestine. She claimed to find the True Cross. Christians were granted freedom of religion after the Edict of Milan was signed by Constantine (Emperor of the West) and fellow “Serbian” Licinius (who controlled the Balkins) in February 313 AD. The next month, Licinius married Constantine's half-sister Constantia. The armies of both Constantine and Licinius fought under Christian banners. Constantine’s military standard consisted of a flag suspended from the crossbar of a cross to symbolize Christ’s crucifixion. Below is a coin of Constantine (c. AD 337) showing a depiction of his banner or labarum with the Chi-Rho symbol above and spearing a serpent below. The spearing of the cosmic serpent (evil) is a theme of the ancient Kushites also. 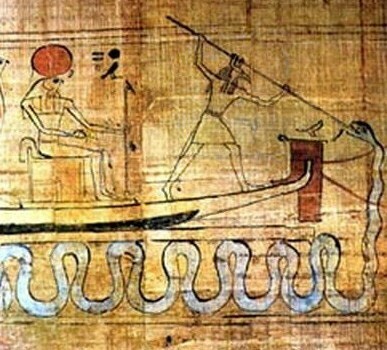 Here Horus, overshadowed by the sun, is seated on barge. Anubis, the jackal-headed totem of Horus, spears the great serpent. Constantine's Christian labarum was made after his vision and subsequent dream. These also are described by Eusebius. Accordingly Constantine called on him with earnest prayer to reveal to him who he was, and stretch forth his right hand to help him in his present difficulties. And while he was thus praying with fervent entreaty, a most extraordinary sign appeared to him from heaven – something which it might have been hard to believe had the story been told by any other person. But since the victorious emperor himself long afterwards declared it to the writer of this history, when he was honored with his acquaintance and society, and confirmed his statement by an oath, who could hesitate to believe it, especially since other testimonies have established its truth? He said that about noon, when the day was already beginning to decline, he saw with his own eyes the sign of a cross of light in the heavens, above the sun, and bearing the inscription, “By this symbol you will conquer.” He was struck with amazement by the sight, and his whole army witnessed the miracle. He said that he was unsure what this apparition could mean, but that while he continued to ponder, night suddenly came on. In his sleep, the Christ of God appeared to him with the same sign which he had seen in the heavens, and commanded him to make a likeness of that sign which he had seen in the heavens, and to use it as a safeguard in all engagements with his enemies. Constantine’s father, Constantius I, died in AD 306 during a stay in York. York was the capital of the Roman province of Britannia Inferior. His son Constantine the Great was proclaimed Emperor by the troops based in the fortress at York. There is a statue of Constantine in the center of York. Constantine ruled from 306-337 AD. Byzantium became the capitol of Constantine’s empire. He intended that it be the “New Rome.” Economically revitalized, Constantinople became the cultural and economic center of the east. Emperor Constantine began the construction of a series of defensive stone walls around the city in 324 AD. Constantine's wall was reinforced with towers at regular distances, and was completed under his son Constantius II who ruled from 337–361 AD. These ramparts are considered the last great fortification system of antiquity. Special commemorative coins were issued in 330 to honor the founding of Constantinople as the capitol of the New Roman Empire. 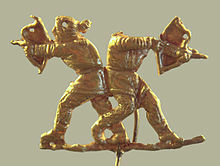 The city was protected by relics, and the figures of Roman deities were replaced or Christianized. Constantine built the Church of the Holy Apostles on the site of a temple that had been dedicated to Aphrodite. Constantinople was one of the original patriarchal sees of the Church. The others were in Antioch, Alexandria, Rome, and Jerusalem. The five cities are called the “Pentarchy” in Church history and there was a conciliar and collegial relationship among these early patriarchs. Constantinople continued to be an important city of the Byzantine Empire until it was captured by the Ottoman Turks in 1453. Related reading: Archaeological Sites in Turkey; Solar Imagery of the Proto-Gospel; Who Were the Kushites? ; Meroe on the Orontes; Ha'biru, Ha'piru, 'Apiru or Hebrew?